I just wanted to let you know, that 5th issue of free internet magazine The Leaf is out. You can read about yixing, tetsubins, Weng Ming Chuan bamboo tea-tools, Ban Zhang pu-erh and more. It’s quite a time I haven’t written anything. Probably a sort of laziness I developed in most recent times. But it caused not only stopped blogging, but also drove me to some easier ways to prepare tea, than gong fu. But spring is finally here, as you can see from pictures. Yes, it's real sunlight. And as the nature wakes up this time of year, I finally gathered enough will to continue writing about tea. Last month or two I tried Japanese green teas - I ordered a tokoname kyusu teapot and few teas from Hibiki-An and O-Cha and experimented with preparation. Actually, it’s really easy – you just boil the water, let it cool down, pour the water into teapot, let it infuse and drink. All I need now is to perfect my skill, learn the right water temperature, amount of leaves, infusion times. Today I had Karigane Gyokure Super Premium from Hibiki-An. Karigane is made from leftover stems and veins of gyukuro (shaded) leaves. 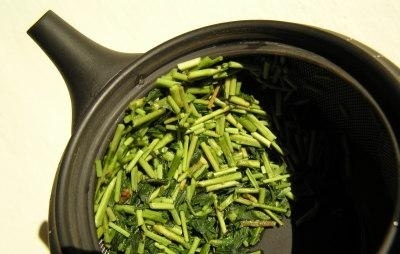 Because the karigane is by-product, it’s cheaper than equally good gyokuro or sencha. 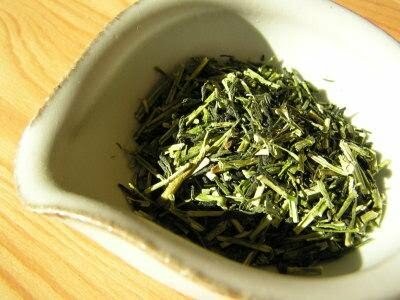 Also, karigane is made only from high grade of Japanese green teas, so you get good value for your money. As seen on dry leaves, the tea consist mostly of soft, short, light green stems and dark green leaves. The smell of these leaves if fresh and vegetal, yet very subtle. Subtle is good description for this tea. The liquor is very light green in colour, clear, like spring water, the smell reminds me of citrus fruits. The taste is sweet, again the slightly acidic, refreshing taste predominates. 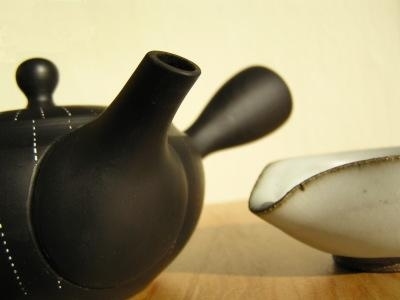 Fortunately for me, the fishy, sea smell sometimes found in Japanese tea is absent in this tea. This tea isn’t really complex and it’s quite easy to ruin it into potato sweetness, but I still like it. Interesting experiment, I have to compare it with other karigane teas I have sampled.